Holly Knitlightly: Adventures in Juicing Part 6! 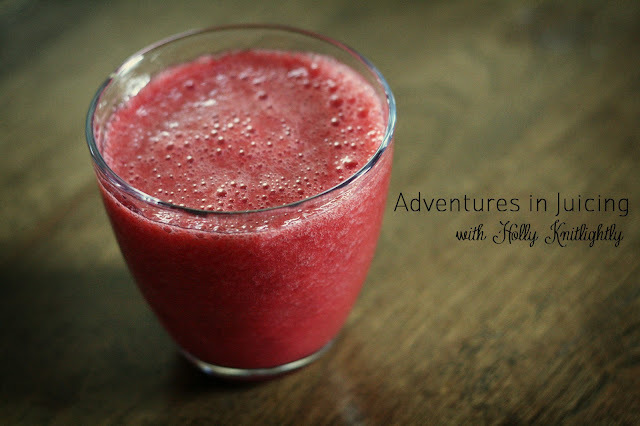 Adventures in Juicing Part 6! Sooo good. It seemed to be fairly warm, so it would have been better with some crushed ice cubes. And it was pretty foaming... so if you're going to be juicing pineapple, I would suggest throwing an apple or two in. But otherwise it tastes so good. Digestion: After a heavy meaty meal, drink pineapple juice, as the protein-digesting enzymes help do the extra work of digesting for you. Respiratory conditions: Bromelain helps to break down and dissolve excessive mucus, providing much relief to sufferers of asthma, bronchitis, pneumonia and sinusitis. Sore Throat: Drinking pineapple juice significantly reduces the soreness and redness in the throat. 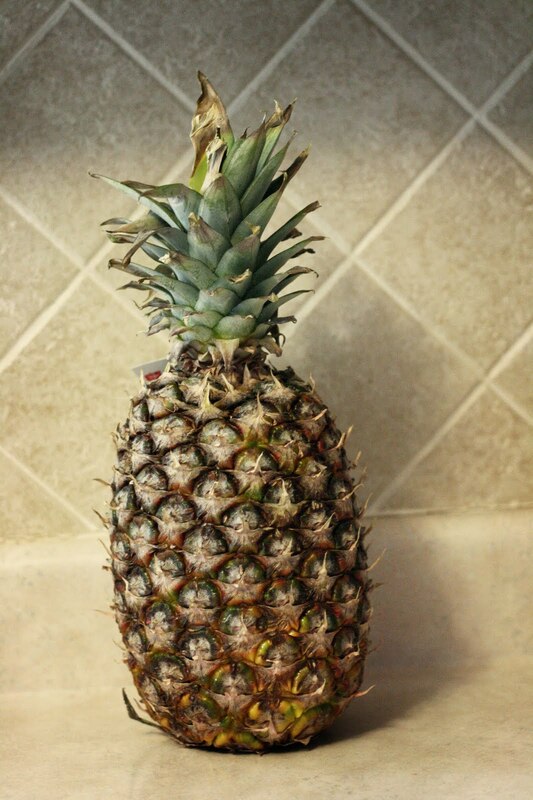 Pineapple is loaded with vitamin C, B1 and smaller amounts of B2, B3, B5 and B6. It is also an excellent source of manganese, copper, magnesium, potassium, beta-carotene, folic acid, and dietary fiber. I had no idea that pineapple helped with sore throats & sinus problems! Awesome. Next time I have a cold I'll be sure to drink lots! that juice looks so good! i wouldn't have thought of putting mint in there too. I'm so glad I tried juicing mint, it makes it SO refreshing! Well, so much MORE! Haha. Delicious. Mint is soo good! I still need to pick up a mint plant so that I can just go out back & juice TONS of it! I also want to start making mint ice tea! Yum! wow. I didn't know pineapple had such great benefits. Just a question - what made you start juicing? I've been wanting to juice for ages, and a few months ago Keith's sister gave me her old juicer so I was able to start! I highly suggest juicing to everyone! There are some inexpensive juicers out there, so it really isn't as expensive as everyone thinks! I am quite convinced that I need a juicer however I'm not sure the space in my kitchen agrees. Haha you should! I keep mine out on the counter all the time, I find having it out there & looking at it every day helps to juice more often! Ooh thank you! Next time I'm at the bookstore I'm DEFINITELY going to check that out! & I'm so glad that you love the series!